Buildings on fire, windows smashed and shops looted - scenes of devastation litter the streets of London after three days of violent riots. ­As part of an ongoing operation to protect people and property, more than 1,700 extra officers have been deployed across the capitol alone. Thousands more officers have been deployed to contain the situation as scenes of lawlessness have spread to other cities, including Birmingham, Liverpool and Bristol. Police officers are also working in a number of London neighborhoods, including Hackney, Newham, Lewisham, Bethnal Green and Croydon. In Enfield, raiders looted shops, making off with whatever they could carry. In nearby Edmonton a man was stabbed. 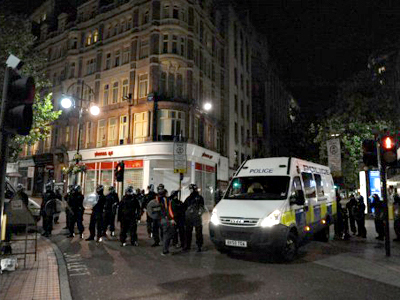 To the south in Brixton, rioters threw rocks at police. In Tottenham, where it all began, the high street is a burnt out shell. Last night police were outnumbered and did not have control on those streets where rioters smashed into shops to loot everything they could. 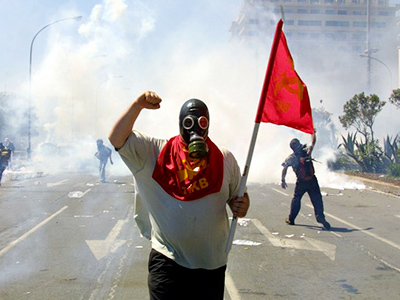 Tonight, instead of 6,000 law enforcement personnel on the streets there are going to be as many as 16,000 police, who promise to be tougher, potentially utilizing water cannons and even regular army to patrol the streets and get things under control. Mark Duggan, whose shooting by police sparked London's riots, did not fire a shot at police officers before they killed him, say the ballistic tests that came back. One of the theories which has not been confirmed, however, claims the bullet became lodged in the radio from a ricochet or after passing through Duggan. London’s metropolitan police reported that an estimated 250-300 people gathered in Pembury Estate in Hackney, setting cars on fire and throwing petrol bombs. Terrified residents can do nothing but observe the madding crowds. Police seals off streets and treat whole areas as crime scenes with local communities trying to come to terms with the wave of looting engulfing northeast and south London. The investigation into the disorder is continuing as police pursue those who have engaged in the violence that left 14 people injured. 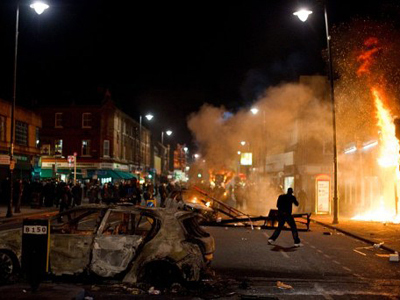 So far, 563 people have been arrested since Saturday and one person killed as a result of the riots. Locals say there is a lot of frustration and anger in London boroughs because of the recession, as the lack of jobs leaves youths with nothing to do. Many rioters on the streets are as young as 14 and it seems that the whole scene is a game to them, as they crash windows and loot shops, laughing. The vandalism and looting followed unrest over the weekend after a 29-year-old-man was shot dead by police on Thursday. Tottenham wants answers as to why and how he was killed. But his shooting was just a spark in an exceptionally dry tinderbox. Tottenham and other London boroughs have long been simmering with resentment towards the police, social injustice and unemployment. “This is the community which is under fantastic pressure of unemployment, they are losing jobs, losing services and their clubs are being closed down. 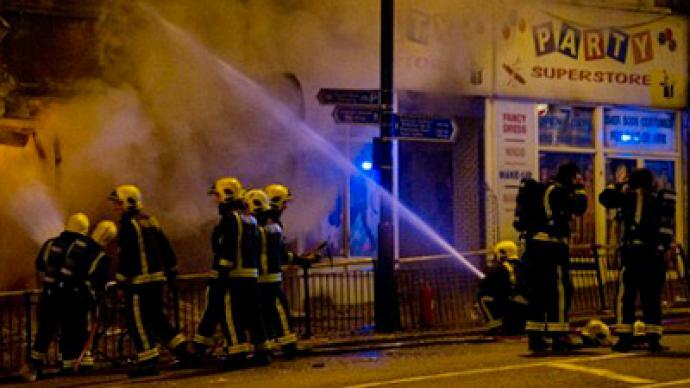 There is never any excuse to violence, but the community was a tinderbox,” explained MP Diane Abbott. 'These boroughs allow so many ethnic groups. And they've put these ethnic groups into sort of ghettos, you know, they've put them all there. They do not respect our English ways. I'm not a racist by no means, but I do think something should be done,” a local white man told RT. The looters are not making any political points, but they are probably the political point by themselves. Social integration in the UK is deplorable, social mobility is nil and the relations with police have been bad for years. As of today, unless these gangs of youth got tired of the violence, there does not seem to be a real reason why the looting in British towns should stop. It is unlikely the perpetrators have jobs to go to and schools are out for the summer, so London residents fear more unrest on the streets in the coming days. With cuts in government spending looming over the next few years, the situation is very unlikely to get any better anytime soon.